• IN FORMER TIMES a poor kindhearted man, by trade a fisherman, lived with his family of three in a straw hut on the banks of a river in the middle of a thick forest. Unfortunately, the fish had been nearly exterminated by the cormorants, and for several days he carried an empty basket home. There was nothing to eat in the cooking pot. His children cried, his wife scolded, but all he could do was to knit his brows. One night, when the moon had just disappeared behind the mountains, he was restlessly tossing about in bed. His wife and children were sleeping soundly. Suddenly he seemed to hear a knock at the door. Thinking that no one could be about at such a late hour, he paid no attention, until finally the knocking became very insistent. Having no fear of ghosts, he pulled on some clothes and glanced out of the window near the bed. The silvery-green disk of the moon was shining through the pines on the western hills, and an icy wind blew in through the window. Going to the door, called out, "Who is there?" "It is I," answered the voice. "I am bringing you fish. Open the door quickly." "Oh, are you Little Number Three?" asked the fisherman, because he had once heard that Little Three caught fish for other people. Since the voice answered his question in the affirmative, he opened the door. A dwarf, clad in a raincoat and a large straw hat, came smiling into the room with a basket full of fish on his back. He told the fisherman to take out half the fish, and to cook and eat the remainder; on no account, though, must he talk to other people about who had brought them. Little Three did the cooking himself in the simplest fashion. He used no spices—only salt and oil—but the food tasted delicious. When they had finished eating, he made an appointment with the fisherman for the following night at a certain place to catch fish. The next morning the fisherman sold the fish, bought some rice, and told his wife that a friend had lent him some money. He sat at home all day and pondered over his experience. When his wife urged him to go out, he merely replied that there were no fish and that it was a waste of time to go down to the river. Night fell and it was soon time to go. His wife and children were asleep; silently the fisherman took a large fishing basket and went off to meet Little Three. He met him by the wild rocks near the river. The spirit impressed on him the need of following closely and not saying a word and of breathing as softly as possible. The fish could not see Little Three, but if they made any noise the fish would swim away at once. The strangest thing was that the dwarf was able to walk on the water, and he only needed to spit on the soles of the fisherman's shoes to enable him to do the same. Naturally, the fish could not see the fisherman either. The fisherman did exactly as he was told. He took great care not to breathe too loudly, and when Little Three caught a fish he took it from him and threw it into the basket. He was kept very busy, and soon became quite out of breath. Before they had gone a quarter of the way, the basket was full; he merely threw the rest of the fish back into the water again, because the spirit went on catching fish without bothering to see whether there was any place to put them or not. A little later they both stepped onto the bank, and shivers ran down the fisherman's spine at the appalling sight of the deep water they had crossed. They returned home, cooked and ate half the fish, and put the other half aside according to the orders the spirit had given. Every night, except at the time of the full moon, they went out fishing, but the fisherman said nothing to his wife. To avoid all suspicion, he even went fishing during the day from time to time. But he earned so much money that his wife became suspicious, and eventually she discovered everything. One night she pretended to be asleep and watched to see what her husband would do. She saw him eating fish with another man and then come into the bedroom and go to sleep. She made no sign, but when he had fallen asleep she got up and saw what they had been doing. The next day she bored a small hole in the plaster wall and watched the two men cooking the fish. she saw how they only cooked half of them, and she thought to herself that if only they could keep the other half they would have food for several days. She made a plan, and the following night, when Little Three came again and placed the pot on the fire, it suddenly went up in flames. The spirit saw at once that something was wrong and ran away. The fisherman was very angry, but not until his wife came into the room with a smile on her face did he know that the pot had been made of paper. From then on, the spirit never came to cook and eat fish. MANY YEARS AGO there lived two boys named Liu Ch'en and Yuan Chao who were cousins. One day they went into the hills to fetch water. It was in the midst of spring, and the hills were carpeted by all sorts of red and green flowers. The boys were so overcome by the beauty of the scene that they put down their pails by the stream and set off for a walk. The country became more and more lonely as they wandered from hill to hill, until the path finally came to an end and they found themselves at the entrance to a cave, with an enormous stone on each side on which two fairies were seated playing chess. The two boys stood in the mouth of the cave and watched the game without saying a word. At the feet of the fairies a white hare was springing up and down. Much to their wonder, the two boys noticed that each time it sprang up the flowers bloomed at the entrance to the cave, and each time it lay down they faded. When the game was finished, the fairies looked around at the boys and asked when they had arrived. "A few hours ago," they both answered, and turned to leave. But the fairies said to them, "Stay here in our grotto and don't go home. No one will recognize you." But they did not understand what the fairies meant, and said firmly, "No! No! We must go home." Seeing that they could not persuade them to remain, the fairies gave them each a piece of reed, saying, "If you find everything changed at home, come back here and point the reed at the cave, and it will open." They took the reeds and returned to the stream by which they had left their poles and buckets. All they found was decayed earth and tall pines growing on each side of the stream, where formerly there had been open ground. In great perplexity they entered the village, but there they could find no trace of their homes. They asked two old white-haired men whom they saw sitting in a meadow where the house of Liu Ch'en and Yuan Chao was. The two old men replied, "Liu Ch'en and Yuan Chao were our ancestors. We are their descendants in the seventh generation. Why do you young fellows talk about them in this casual way?" This was still more confusing, because how could two young men have descendants in the seventh generation? Perhaps the white hare jumping about in the fairy grotto represented the seasons, and the afternoon they had spent in the cave had lasted for four or five hundred years. When the two children heard the words of the old men, they said, "But we are Liu Ch'en and Yuan Chao!" This made the old men so annoyed that their beards waggled to and fro. They called-out to other people, who came up and beat the two boys. "You young rascals," they cried, "how dare you come and bother old men!" The boys fled back to the cave, but the doors were closed tight. Then they remembered their reeds, but they could not recall where they had left them. They did not dare to go back and look for them for fear the people would beat them again. They knocked and knocked, but there was no answer, and in their grief they banged their heads against the wall and died. The ruler of heaven took pity on their sad fate, and appointed Liu Ch'en the god of good luck and Yuan Chao the god of ill luck. THERE ONCE LIVED in a small town in China a man named Hok Lee. He was a steady, industrious man, who not only worked hard at his trade, but did all his own housework as well, for he had no wife to do it for him. "What an excellent, industrious man is this Hok Lee!" his neighbors said. "How hard he works. He never leaves his house to amuse himself or to take a holiday as others do! " But Hok Lee was by no means the virtuous person his neighbors thought him. True, he worked hard enough by day, but at night, when all respectable folk were fast asleep, he would steal out and join a dangerous band of robbers who broke into rich people's houses and carried off all they could lay their hands on. This state of things went on for some time, and though a thief was caught now and then and punished, no suspicion ever fell on Hok Lee, he was such a very respectable, hard-working man. He had already amassed a good store of money as his share of the proceeds of these robberies when it happened one morning on going to market that a neighbor said to him, "Why, Hok Lee, what is the matter with your face; One side of it is all swelled up." True enough, Hok Lee's right cheek was twice the size of his left, and it soon began to feel very uncomfortable. "I will bind up my face," Hok Lee said. "Doubtless the warmth will cure the swelling." Next day, however, it was only worse, and day by day it grew bigger and bigger till it was nearly as large as his head and very painful. Hok Lee was at his wits' end what to do. Not only was his cheek unsightly and painful, but his neighbors began to jeer and make fun of him, which hurt his feelings very much indeed. One day, as luck would have it, a traveling doctor came to the town. He sold not only all kinds of medicine but also dealt in many strange charms against witches and evil spirits. Hok Lee determined to consult him and asked him into his house. After the doctor had examined him carefully, he said, "This O Hok Lee, is no ordinary swollen face. I strongly suspect you have been doing some wrong deed which has called down the anger of the spirits on you. None of my drugs will cure you, but if you are willing to pay me handsomely, I will tell you how you may be cured." Then Hok Lee and the doctor began to bargain, and it was a long time before they could come to terms. The doctor got the better of it in the end, for he was determined not to part with his secret under a certain price, and Hok Lee had no mind to carry his huge cheek about with him to the end of his days. So he was obliged to part with the greater portion of his ill-gotten gains. When the doctor had pocketed the money, he told Hok Lee to go on the first night of the full moon to a certain wood and there to watch by a particular tree. After a time the dwarfs and sprites who live underground would come out to dance. When they saw him they would be sure to make him dance too. "And mind you dance your very best," added the doctor. "If you dance well and please them, they will allow you to present a petition and you can then beg to be cured; but if you dance badly they will most likely do you some mischief out of spite." With that he took his leave and departed. Happily, the first night of the full moon was near, and at the proper time Hok Lee set out for the wood. With a little trouble he found the tree the doctor had described, and feeling nervous, he climbed up into it. He had hardly settled himself on a branch when in the moonlight he saw the dwarfs assembling. They came from all sides until at length there appeared to be hundreds of them. They seemed in high glee, and danced and skipped and capered about, while Hok Lee grew so eager watching them that he crept farther and farther along his branch until it gave a loud crack. All the dwarfs stood still, and Hok Lee felt as if his heart stood still also. Then one of the dwarfs called out, "Someone is up in that tree. Come down at once, whoever you are, or we must come and fetch you!" In great terror, Hok Lee proceeded to come down, but he was so nervous that, just before he reached the grounds he tripped and came rolling down in the most absurd manner. When he had picked himself up, he came forward with a low bow, and the dwarf who had first spoken and who appeared to be the leader, said, "NOW then, who are you, and what brings you here?" So Hok Lee told him the sad story of his swollen cheek, and how he had been advised to come to the forest and beg the dwarfs to cure him. "It is well," replied the dwarf. "We will see about that. First, however you must dance for us. Should your dancing please us, perhaps we may be able to do something, but should you dance badly, we shall assuredly punish you; so now take warning and dance away. With that, he and all the other dwarfs sat down in a large ring, leaving Hok Lee to dance alone in the middle. He felt half frightened to death and, besides, was much shaken bet his fall from the tree, and he did not feel at all inclined to dance. But the dwarfs were not to be trifled with. "Begin!" cried their leader, and, "Begin!" shouted the rest in chorus. In despair Hok Lee began to dance. First he hopped on one foot and then on the other, but he was so stiff and so nervous that he made but a poor attempt, and after a time sank down on the ground and vowed he could dance no more. The dwarfs were very angry. They crowded round Hok Lee and abused him. "You come here to be cured, indeed!" they cried. "You have brought one big cheek with your but you shall take away two." With that they ran off and disappeared, leaving Hok Lee to find his way home as best he might. He hobbled away, weary and depressed, and not a little anxious because of the dwarfs' threat. Nor were his fears unfounded, for when he rose next morning his left cheek was swelled up as big as his right, and he could hardly see out of his puffy eyes. Hok Lee was in despair, and his neighbors jeered at him more than ever. The doctor had disappeared, so there was nothing for it but to try the dwarfs once more. He waited a month until the first night of the full moon came round again, and then he trudged back to the forest and sat down under the tree from which he had fallen. He had not long to wait. Before long the dwarfs came trooping out until all were assembled. "I do not feel quite easy," said one. "I feel as if some horrid human being were near us." When Hok Lee heard this, he came forward and bowed down to the ground before the dwarfs, who came crowding round and laughed heartily at his comical appearance with his two big checks. "What do you want now?" they asked. Hok Lee proceeded to tell them of his fresh misfortunes and begged so hard to be allowed one more attempt at dancing that the dwarfs consented, for there is nothing they love so much as being amused. Now Hok Lee knew how much depended on his dancing well. He plucked up a good spirit and began, first slowly, then faster by degrees, and he danced so well and so gracefully and invented such new and wonderful steps that the dwarfs were quite delighted with him. They clapped their tiny hands and shouted, "Well done, Hok Lee, well done. Go on, dance some more." And Hok Lee danced on and on until he really could dance no more and was obliged to stop. Then the leader of the dwarfs said, "We are well pleased, Hok Lee, and as a recompense for your dancing your face shall be cured. Farewell." With these words he and the other dwarfs vanished, and Hok Lee, putting his hands to his face, found to his great joy that his cheeks were now their natural size. The way home seemed short and easy, and he went to bed happy, and he resolved never to Pro out robbing again. Next day the whole town was full of the news of his sudden cure. His neighbors questioned him but could get nothing from him except that he had discovered a wonderful cure for all kinds of diseases. After a tints a rich neighbor, who had been ill for some years, came and offered Hok Lee a large sum of money if he would tell him how he might be cured. Hok Lee consented on Condition that the neighbor would swear to keep the secret. He did so, and Hok Lee told him of the dwarfs and their dances. The neighbor went off, carefully obeyed Hok Lee's directions, and was duly cured by the dwarfs. Then another and another came to Hok Lee to beg his Secret, and from each he extracted a vow of secrecy and a large sum of money. 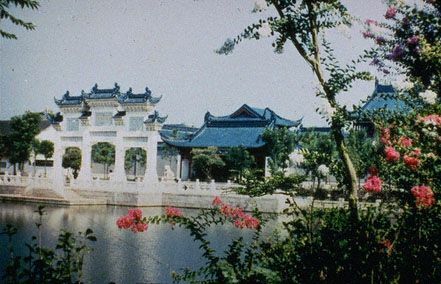 This went on for some years, so that at length Hok Lee became a very wealthy man and ended his days in peace and prosperity.